Thanks to a $25,000 grant from American Airlines, plans are taking off on the Kansas State University Polytechnic Campus to help more secondary students learn what it’s like to be an airplane pilot. The grant, designed to increase enrollment in Kansas State Polytechnic’sprofessional pilot degree program, will fund construction of a mobile aircraft simulator lab, support short introductory flights for prospective pilot students and sponsor middle and high school student scholarships to the campus’s aviation youth Discover Programs. 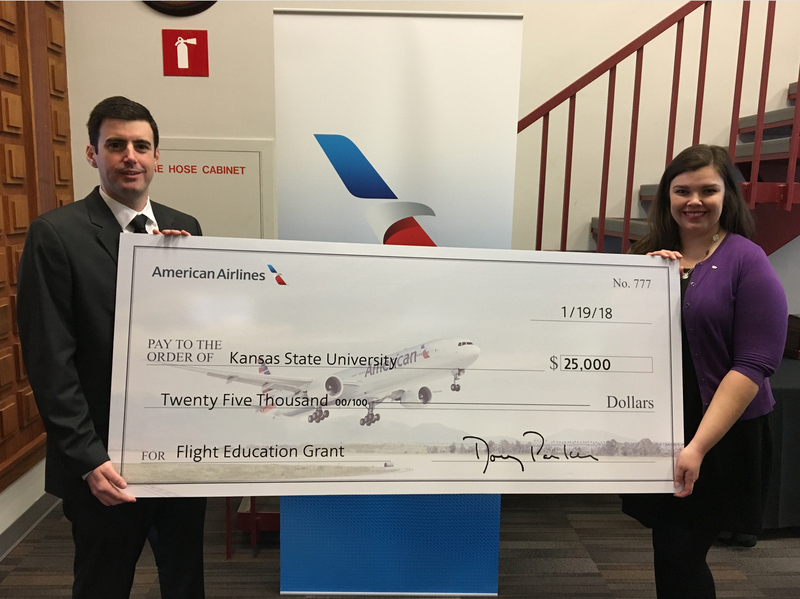 Kansas State Polytechnic received the Flight Education Grant from American Airlines at a recent luncheon in Dallas. It was accepted by Ben Jaffee, senior assistant chief flight instructor, and Kirsten Zoller, training and event coordinator, at Kansas State Polytechnic. The mobile lab will be constructed by placing one of the campus’s retired aircraft simulators into a specially designed enclosed trailer. It will then be taken to schools, county fairs and community events to give youth and prospective students a hands-on introduction to the pilot profession. “We anticipate that at least 1,000 students in 10 locations will complete a short flight mission in the lab’s first year of operation, and we hope to reach many more in successive years,” Jaffe said. The grant also means more secondary students will be able to participate in the Fly K-State Academy and Aviation Fixation programs on the Kansas State Polytechnic Campus. “We now have 10 scholarships for each program that can help middle- and high-schoolers participate in these exciting on-campus opportunities,” Zoller said. The Flight Education Grant-funded activities are expected to begin in spring 2018. For more information contact Zoller at [email protected] or 785-826-2633.